Cauliflower soup is nothing really new. But I do like to put a little char from the grill on my veggies to give them a smoky flavor. When its winter in Chicago- this is not really possible. So this is one of those times that I go to the liquid smoke, not a lot, but enough get the flavor in there. I also used a head of orange cauliflower here. It was a quarter of the price of the white and after a little research, I found out that the orange head has twice the nutrients too. 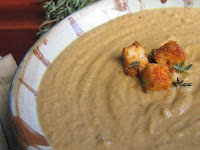 So now I have a creamy, smoky soup that's chock full of antioxidants and cost just pennies. How can you go wrong? Make a soup today- you'll feel super warm and satisfied! And soups do freeze well- so make a double batch for those days you have completely no energy to make anything else. 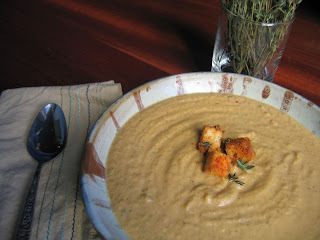 Top the soup with some tasty homemade croutons (recipe below), serve with a good red ale and you'll be fat, happy and warm!! **if you can grill your cauliflower, do so. Then omit or reduce the amount of liquid smoke used later. add enough stock to just cover the ingredients. simmer for about 10 minutes, uncovered. carefully blend the soup (using either an immersion blender or your counter top blender). Blend to your linking- if you like a chunkier soup, blend less or blend more for a smoother soup, and you may find you need to add slightly more stock for a thicker soup (or less for thinner). Take stale bread, cut into bite sized pieces. Toss with olive oil, fresh thyme, garlic salt and fresh black pepper. Bake until crunchy.